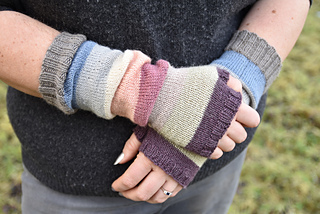 These elbow length fingerless mitts are the perfect antidote for cold arms. They’re great for wearing with short-sleeved tops when the weather turns, and work just as well under long-sleeved tops/jackets. Wear them fully stretched or cosily squooshed around the wrists; they work just as well either way. 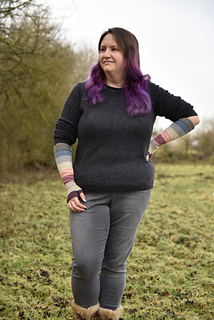 They can also easily be made in one colour - they require approximately 60g of yarn in total. One set of 2.5mm / US 1.5 double pointed needles (or the size needed to obtain the correct gauge). 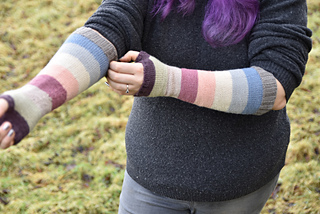 The mitts should fit with approximately 10cm/4 in negative ease on the circumference. Size could be adapted by casting on more or fewer stitches.